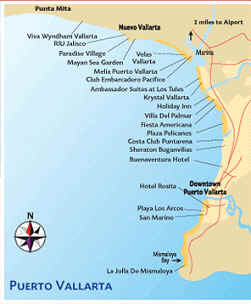 Deluxe studios and suites beachfront resort located in the hotel zone, close to all Puerto Vallartas restaurants and bars. Resort Room, 1 king bed or 2 double beds, satellite TV, phone, in-room safe, bathroom with tub and shower, floor to ceiling oceanfront window. (Max. Occ. 3 ad or 2 ad + 2 ch). Tower Room, same as resort room with mini-bar, butler service including hors doeuveres and wine in VIP lounge. (Max. Occ. 3 ad or 2 ad + 2 ch). One Bedroom Suite, available. (Max. Occ. 4). Facilities: Pools. Swim up bar. Jacuzzi. Poolside lounges and towel service. Restaurants. Bars. Snack bar. Lit tennis. Fitness center. Full spa. Shops. Activities program. Spa and Meal Deal: Special rates available inquire at time of booking. Kids Stay Free: Kids 17 years and under stay free when in room with 2 adults. 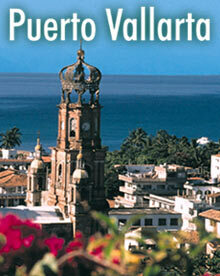 A new property which opened in summer 2002, located in Nuevo Vallarta on an exceptionally long fine sand beach. 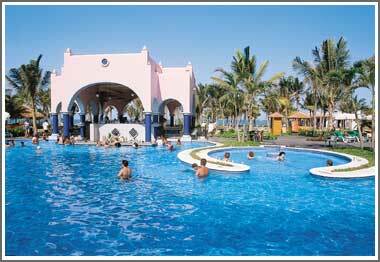 The RIU Jalisco, already highly regarded by SunTrips customers, offers the very finest in comfort, quality, service and sports and leisure facilities. ACCOMMODATION: Hotel Room, A/C, ceiling fan, 2 double beds, satellite TV, phone, mini-bar, liquor dispenser, in-room safe, hair dryer, bathroom with shower, balcony or terrace. (Max. Occ. 3 ad or 2 ad + 2 ch). scuba lesson in pool, day/night tennis, multi sports court, non-motorized watersports including windsurfing, sailing, kayaking and snorkeling, disco (entrance and drinks), gratuities.